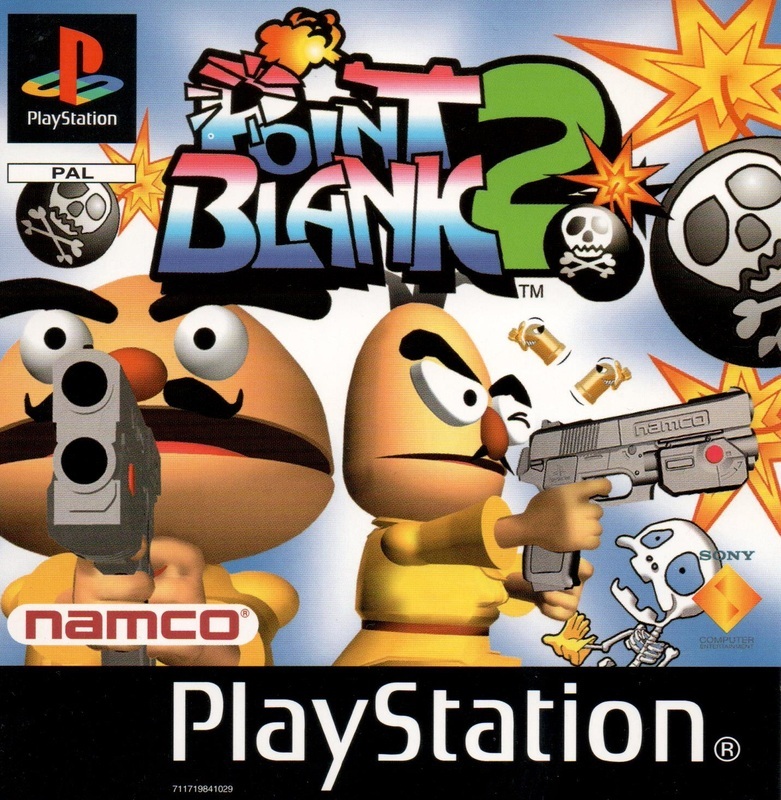 Only a year after the first arcade port of Point Blank was released onto the PlayStation, the second game made its presence known to a far lesser degree. Many people missed the sequel to Dr Don and Dr Dan’s lightgun-toting adventures, possibly due to a less significant coin-op roll out resulting in a title many missed. 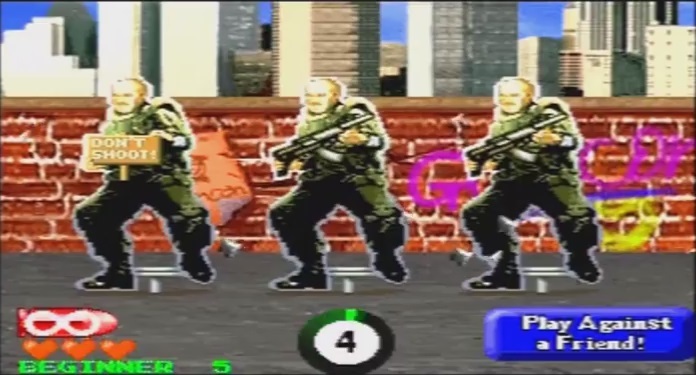 Myself included, as I was unaware of Point Blank 2 until several years later the date of release. Following the same design and approach as the first game, PB2 gives us all new and original games plus numerous alternative modes heavily directed at local multiplayer gaming. This attempts to give the franchise a little more weight and lasting appeal, but in some minor aspects doesn’t seem to completely capture the magic of the first title. This time we are treated to an amusing and smartly done intro cartoon, making the comedy slapstick anime style obvious from the outset. It’s nice to see this and does get you in the mood. Unlike the simple box menus of the original, here we have an entirely new presentation. 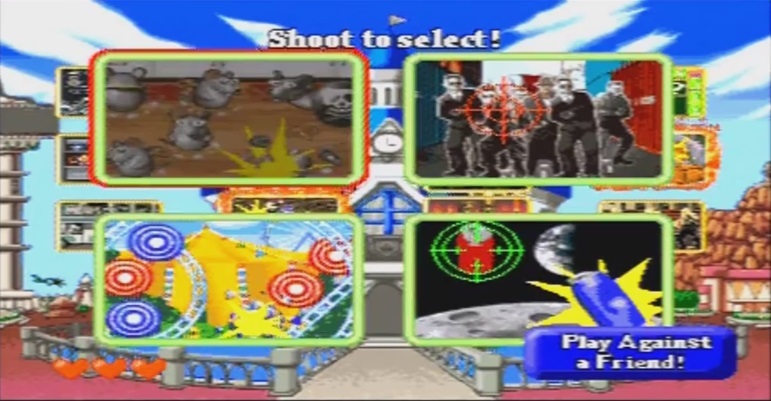 The Point Blank theme park is the base of operations, and all the game modes are chosen from here via the lightgun. It’s a jolly interactive menu screen, if a little over the top and messy, and finding the stalwart arcade mode can be cumbersome. But that said, it’s simple enough to use and find your way around after a few minutes. 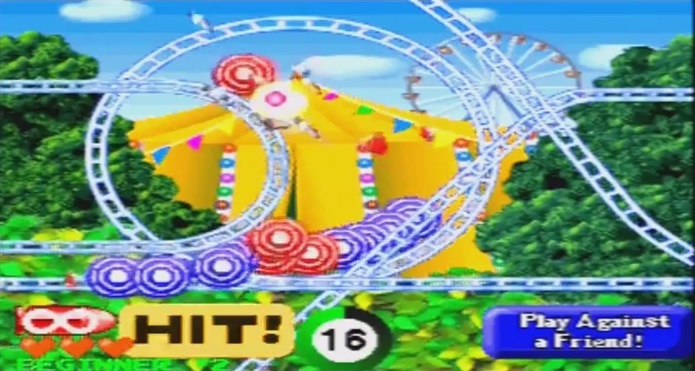 A typical fair ground music backing is played, which while in theme with the game becomes a little annoying after prolonged periods, and this becomes a recurring issue. But once your game mode is selected, it’s business as usual in terms of shooting cardboard cut-outs, neon lights and moving barrels. Less obvious are the minor improvements to the visuals. Colours appear brighter and bolder, with more detailed sprites and backgrounds. Sharpness has also been tweaked and the layouts have been slightly adjusted to make the appearance look better than ever even if barely noticeable on first glance, and of course keeping the good-natured ‘fun’ characteristic throughout. The theme park trope is firmly attached to many of the games, with repeated icons, background details and familiar characters popping up all over, so they all feel they belong in this fictitious amusement park. There is a definite shift toward anime chic, much more so than the first title. This is uniform with all the modes, with no glitches or graphical problems to spoil your gunplay shenanigans. The hit detection is again spot-on, and it has to be as this time around the games can be significantly more difficult. The arcade and endurance modes are as though as any gallery shooter can be to complete the highest levels, with the difficultly toned down a bit for the story mode and multiplayer selections. As expected, the Arcade mode is straightforward and follows the exact same template as the original, being the best part of the whole thing, with new games and a wider variety. More than 70 different events in fact, testing the different skill sets ranging from reactions, speed, accuracy and mental agility. 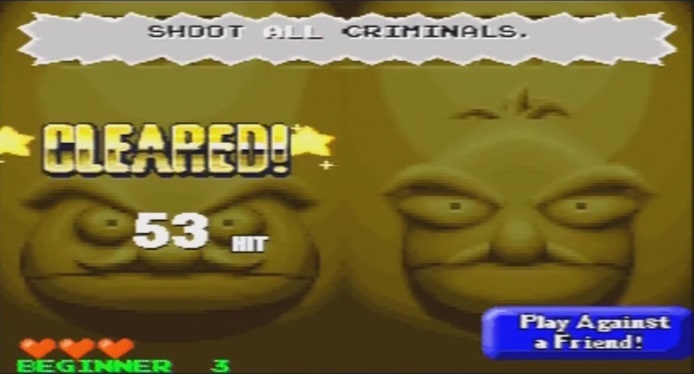 Now included are audio based games, where the player must listen to the sounds to latch onto a target. In general, the events are more complex on the whole but equally as enjoyable as before, and maybe a little more rewarding to complete. The alternate modes are a very welcome addition, but some don’t deliver the thrills they promise and feel more tacked on then an intrinsic addition. The story mode is slow paced, linear and frankly rather dull, comprising only of 4 games in which you have to achieve a target score to progress. I found this pretty easy and after completing it, couldn’t find a reason to replay this mode. Endurance mode can infuriatingly hard, but very enjoyable and satisfying when you top your own scores but only for the hardened shooter fan, and the multiply events are great fun as long as you have a couple of G-Con’s at your disposal. Team battles and the turf war modes again add a little spice to having a lightgun party, if that’s your thing. As I have already touched upon, the music that features in Point Blank 2 doesn’t have that catchy but agreeable note to it. 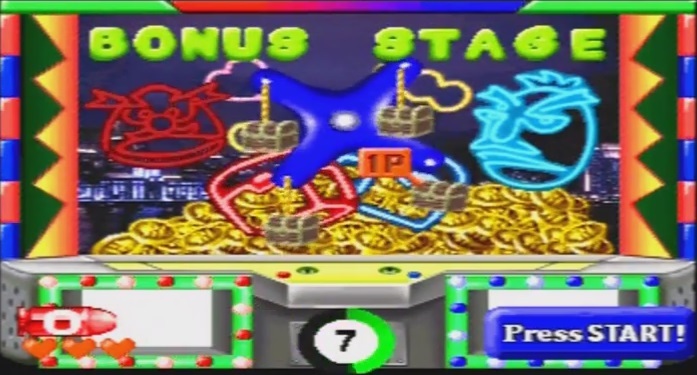 Some tunes like the introduction music are great, but all too often you find yourself getting annoyed with the tinny, inane, toyland tunes; something which the first game avoided. 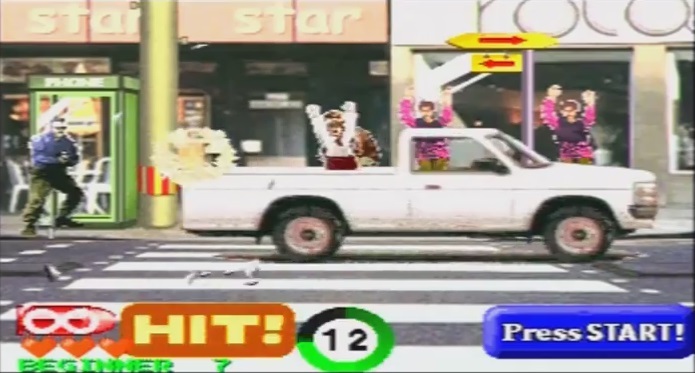 Although a small detail, the tune on the judgement screen has been changed to a funky flat ditty, and not the celebration game show jingle of the original. It’s a minor point, but adds to my reasoning of why this Point Blank is not as good or as pleasing as the first. 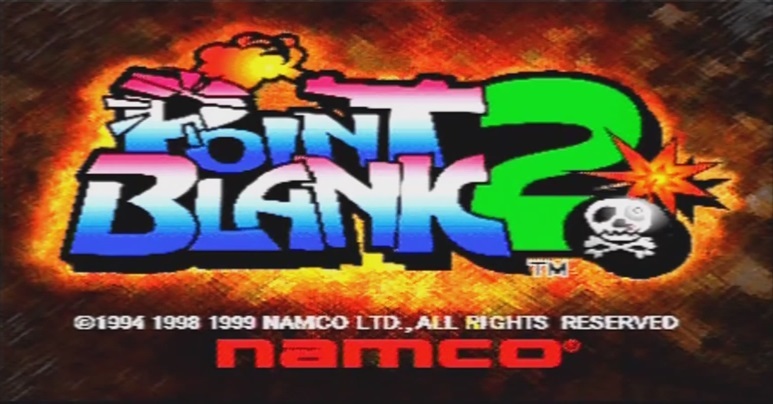 With the myriad of new modes and oodles of original challenging games, plus the slender improvement on the visuals, Point Blank 2 should be equal if not superior to its forebear. It certainly is a nice game to play for sure, but with some of the modes proving tedious or awkward, and with the decline of the music quality, it loses a smidgen of the charm which made the first game so good. Add to this that the difficulty has been ramped up, maybe to much in some cases, and players may find they won’t stick with this as they did before. It’s an adequate sequel in many ways, and the additional material is much appreciated, but maybe this is a case of ‘too many cooks spoil the broth’. One thing that didn’t need changing much was the music, which for me has been taken from the Sesame Street school of jingles, and that is perhaps it’s biggest problem. Still, all the innocent shooting joy can be found here just as before, as long as you hit that mute button occasionally.